The player registration fees for 2017/18 season are as follows. The fees include all training and matches, the cost of pitch hire and referees. From U8s training is midweek on floodlit 3G pitches during the winter season, and the cost of 3G pitch hire is included in the fees. The U7s get their own Nike club jacket. All league registered players from U7s up receive a new pair of Nike shorts and socks for playing matches. Match shirts are provided by the club. 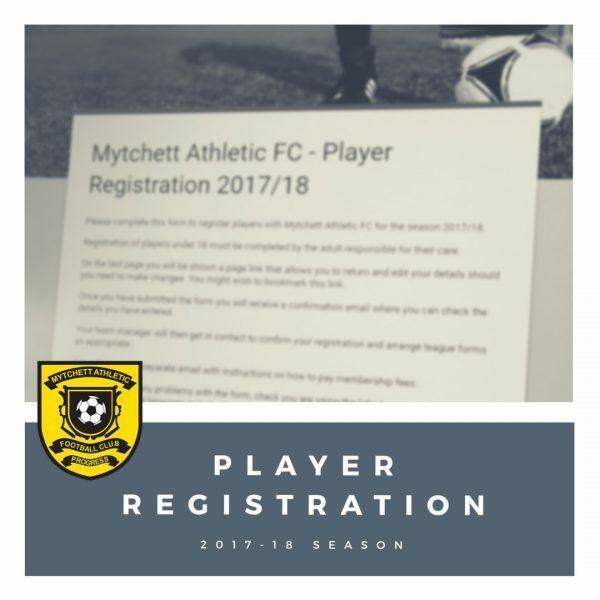 All FA and League administration costs are covered and by registering as a player with Mytchett Athletic FC each player is covered under the club’s Public Liability Insurance and Group Personal Accident Insurance. All players are required to complete their online club registration by accessing the following link. After you submit the form you will receive an automated email response so you can check the details you supplied and if necessary go back and make any corrections. The details you supply will only be used by club officials for the purpose of managing your club membership and communication with you regarding club and team matters. None of your data will be shared with third parties and it will be destroyed at the end of the playing season. All our club officials details have been retained so there is no need to re-register. Please email registrations@mytchettathletic.com if there are any changes to your contact details (email, phone, address etc). Similarly, please let us know if you will not be continuing in your role and we can remove your details as appropriate. Team managers/administrators will assist you with the appropriate league registration process. Please note that players will not be eligible to play in matches until registration is complete and fees are paid. Once you have completed the online registration form you will receive two emails. The first is an automated form response so you can check your supplied details and make any corrections. Within the next 24 hours you should receive a second email welcoming you to Mytchett Athletic FC, which will explain how to pay your membership fees. The preferred method of payment is via bank transfer or standing order, although we can still accept cash and cheques. If you are unable to pay the full fee at time of registration, then we have a payment plan option. To help us administer this we ask that you set-up a monthly standing order. Full details of how to pay will be included in your Welcome Email. Players may be suspended from matches or training if they fall behind in their payments. Please take a moment to read the FA Codes of Conduct. We expect all players, spectators and club officials to conduct themselves in keeping with the spirit of the game. Contravention may result in expulsion from the club. Watch the FA Respect Campaign Video featuring Ray Winstone. This type of over-zealous, aggressive behaviour is exactly what we DON’T want to see. For more videos by the FA visit the Mytchett YouTube channel and access playlists. We take the responsibility of coaching your children seriously, and it’s important you know what to expect from us. That’s why we have a Club Ethos and Coaching Philosophy. Please have a read and feel free to ask any questions.